does yoga have to be spiritual? A science and art of living. Intended to unite the mind, body and spirit. A Hindu spiritual and ascetic discipline. A practice of physical, mental, and spiritual discipline, originating in ancient India. But, what about the real reason many people come to yoga…stretching out because our bodies are whacked from years of overuse or under-use and sitting too much? So, I suppose just by definition “yoga” is something more than the physical practice most of us interpret it as. It tones, strengthens, and lengthens the body, it can be a contortionistic, challenging, and fun way to move the body. Many of us are only drawn to the physical practice although that is only one piece of the yoga pie. Don’t get me wrong. People being healthful physically is important. Without that quest, nothing else really works, does it? Have you ever noticed this? Without a clear body, the mind can easily succumb to the BS of life. And it’s just harder to live a good life that way. But isn’t it good to be honest about the fact that what we do in a yoga studio is connected to something more, even if we don’t care to acknowledge it most days? But is yoga spiritual, even if what we regularly practice doesn’t feel like it is? What is the definition of spirituality? The first definition was “Property or income owned by a church.” —Well that’s kind of funny. Would we get free rent at Smiling Dog if it was a church? That would be sweet! I suppose the historical practice of yoga does contain spiritual components. It teaches us how to live, breathe, get out of our overactive minds, and if we’re lucky, life to our fullest potential. BUT there are parts of yoga that are merely physical, and many people will spend their entire lives only working on the physical body with yoga and will never address the problems their crazy minds inflict upon themselves. Most yoga classes aren’t spiritual and those offered at gyms, jails, and beyond most certainly aren’t. Or maybe they are, but it’s just more subtle. I wonder if that’s a good thing or bad thing? And I wonder how much spirituality is appropriate? And why does the word spiritual only get to be used by churches and Christians? The word frankly turns many off and turns on defensive responses. I often refer to tidbits of yogic philosophy in my classes and I wonder if it’s just spirituality that I’ve learned to define in a way that isn’t daunting or offensive. So, my answer is this. No, yoga doesn’t have to be spiritual. But I wonder if yoga teachers should be? And how much spirituality should be brought into classes? Can you learn one part of a vast subject and teach that one part well without knowing or honoring the related pieces? Probably well enough. But why is it that doesn’t sit well with me? Oh, I’m getting deep today folks. So deep! It reminds me of my math teaching days. I most certainly would be a math professor if I could have done so without learning the theory behind the calculus. Donna Fahri says it well in her book Teaching Yoga, “If we profess to be teaching Yoga, which is a science and art of living, we must practice that way of living ourselves. If we wish only to teach poses or postures, it would be better to call what we do by a name other than Yoga”. I used to think I wasn’t spiritual and that spirituality wasn’t part of my yoga experience. I now realize the opposite is true. Sure, I can call it mindfulness, philosophy, being present, but it’s all leading me to live a healthier, happier, more sane life, and that’s what counts. Who cares what label it has. This entry was posted in remember, spirituality, yoga teaching. Bookmark the permalink. 3 Responses to does yoga have to be spiritual? Thanks for this commentary, Roxy. 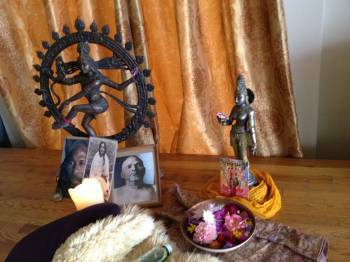 It’s unquestionable that yoga was for many years a primarily spiritual practice. It’s also the case that in America, now, most Americans who practice yoga don’t assert overt spirituality. And those many not-overtly-spiritual American half-yogis are still much better off, in many diverse ways, by practicing yoga asana, and meditation, than would otherwise be the case. And that’s enough. Yogic spiritual “bundling” is religious dogma. Lack of that dogma is part of the reason for yoga’s success in America in the first place. Change Is In The Air, Always!